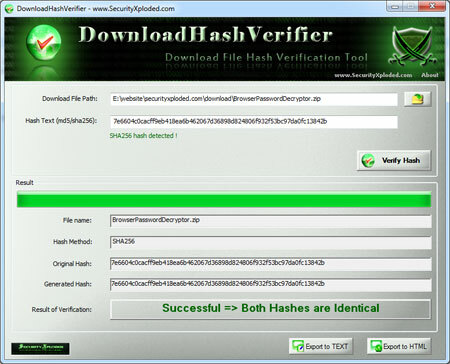 Download Hash Verifier is the FREE tool to verify the integrity of your downloaded file. It makes file hash verification easier and quicker with its smart features such as 'Auto Hash Detection', 'Drag & Drop File', 'Instant copy from Clipboard' etc Hash verification is a standard mechanism used to verify that downloaded file is original and not tempered. Often it happens that hackers modify the download files on the server and plant it with trojans/spywares. Upon downloading and installing such softwares your PC will get infected eventually. To prevent such things, websites generally publish MD5 or SHA256 hash of the original file so that you can verify the same after you have downloaded the file. DownloadHashVerifier is designed to make this verification task easier and faster for end users. Here are the major benefits and features * Easily & Quickly verify the hash for your downloaded file. * Right click context menu integration - now launch directly by right clicking on the downloaded file. * Supports popular MD5 & SHA256 hash verification * Automatically detects input hash data as MD5 or SHA256 * Automatically validates & copies the hash data from clipboard * 'Drag & Drop' feature to quickly choose your downloaded file. * Save the verification result to HTML or TEXT file * Completely Portable Tool which also comes with Installer. Download Hash Verifier works on wide range of platforms starting from Windows XP to latest operating system Windows 8. Want to Clean out all temporary files from the temp folder or any folder you specify from your computer you can use this program. The program has a built in Shredder, so the cleaned files/folders can not be recovered again. Estelar Protect A Folder is easy to use advanced security software which lets a user to protect a folder, file and removable drives using a password to restrict access from unwanted users. Content Advisor Password Remover is a program that is able to find and remove the Content Advisor Password also known as Internet Explorer Supervisor Password. Clean N' Optimize is a powerful easy to use tool to Clean, Optimize, and protect your system. It has a built in Shredder, so the cleaned files/folders can not be recovered again.and includes Ask.com's convenient search functionality..
Forgot/lost your RAR archives password? Don't be concerned RAR Password Recovery tool can help you Unlock/Bypass RAR Archives. If you can't open the password-protected MS Excel (*.xls,*. xlsx) file using the forgotten password? Do not worry! Excel Password Recovery software can help you recover lost/forgot password for Microsoft Excel files developed by MS Excel. Lost/Forgot password for ZIP/WinZip/7Zip archives ? Don't be concerned ZIP Password Recovery tool is a advanced zip archive password recovery tool for recovering your lost/Forgot or forgotten password for ZIP/WinZip/7Zip archives. Pdf encryption software lock pdf file with two types of password security, user password and owner password. User lock prevents un-authorized access and owner password adds restrictions to edit, print, copy, form fill, sign or comment etc. Encrypt pdf document with 128 bit and 40 bit RC4 encryption level security. User can restrict pdf print, edit, copy, form fill, sign, comment, copy for accessibility and page extraction. Protect pdf files with open password security & restrictions. KernSafe SecureCD Creator is an advanced and powerful, full-featured CD encryption software. Create, edit, modify iso9660 files, and mount to virtual CD-ROM emulator or burning into a password protected CDs. This site does not contain serial number, crack, keygen Download Hash Verifier serial number : serial number is the simplest type of crack. A serial number(cdkey,product key,etc) is register the program as you may already know. a crack or keygen may contain harmful software. If you cannot find the exact version you want, just give it a try. for more information read .nfo/.txt/.diz file include in zipped file.